This is Lennar’s first foray into the single family rental space, nation-wide. The project opened in March 2015 and is leasing-up at just over nine units per month on average (for perspective, Higley Homes in Arizona introduced a 185-unit single family rental project in 2012, and it leased up at a rate of eight to 10 units per month). Concessions are not currently being offered, and leases offered in 12-month increments only. With Phase 1 of 80 units over 55% leased and 34% occupied, Phase 2 of 154 units could start leasing this December. Tenants range from “would be” 1st time home-buyers (that can’t qualify for a loan) to downsizing homeowners (don’t want yard maintenance), with 20-30% of tenants coming from out-of-area (TX, CA and NY noted). Most popular floor plans to date are the three smallest (1,210 to 1,642 square feet) with the lowest price-points ($1,574 to $1,799 per month). Frontera faces minimal competition with traditional attached apartment and detached “for-sale” communities (in spite of having four Lennar projects within a 3.5-mile drive). So how does Frontera compare to other housing options in the area, such as conventional attached apartments and/or detached “for-sale” homes? Frontera’s absorption is generally much slower than traditional apartment communities, but much faster than for-sale housing developments. 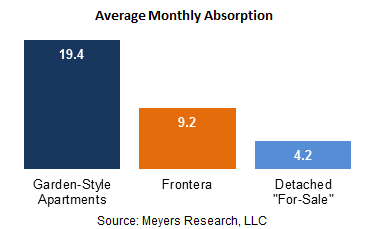 Frontera’s home sizes tend to be larger than local conventional rental product but smaller than nearby for-sale housing. While base rents at Frontera tend to be higher than local conventional rental product, rents for Frontera’s most popular floorplans tend to be lower than implied monthly payments for new home communities in the same area. A big “take-away” from this research is that builders can fill a void in the market by offering homes that are larger than conventional rental apartments but cheaper than buying a home. They can also leverage their position as landlord to help drive traffic to their traditional for-sale options in the same market. These factors are evident as continued demand and plans for a second phase imply that Lennar has found its niche in Reno and will likely be successful over the long term. Contact Brent with any questions on how we can help you plan for your next rental (or for-sale) neighborhood.